A dull, wet Saturday in March saw a number of would-be-Shoguns arrive at Warlord Games in Nottingham. Warring States II was organised by the fine chaps of Infamous Wargaming, and provided a full day of gaming, using the Test of Honour Samurai Skirmish rules from Warlord Games. Keeping with tradition, I had not finished painting until the previous evening – although in my case it wasn’t my miniatures that were being finished at the last minute, but rather the terrain table that I had agreed to provide. Whilst I was originally going to create a village layout, my thinking was (correctly, as it turned out) that everyone would be doing a village layout, so I would do something a bit different. Inspired by the forthcoming release of a Sohei Temple from Sarissa Precision, the table I provided was a walled Temple compound – which luckily all came together rather well, as putting it together on the table was the first time everything had been assembled together. My own warband for the day was somewhat simple – I wanted to try out the new Ninja warband, and I decided at the last-minute to add a Geisha Spy to the mix, as I thought her unique skills could prove useful in a couple of the scenarios. For the initial battle of the day, a small attacking force was trying to prevent the defenders from leaving the board. Night-time rules were in use, so it seemed entirely thematic that my Ninja were attacking Chris Hewitson’s Warband. The plan was for my Ninja to sneak within visibility of Chris’ Commoner groups, and then pepper them with shuriken whilst remaining out of sight themselves. This worked well to begin with, but Chris’ Hero quickly became aware that he was being attacked, and decided that the only good Ninja was a dead Ninja, so decided to start cutting apart my small force – which was fine, except that this wasn’t really what was required from the scenario: the defenders had to escape the table, not kill the opposition. As a result, I ended up (rather fortunately) winning the fight as my Ninja Hero made several kills in the middle of the table. This second game had the winning condition of dominating the battlefield, getting points for being in the centre or opponents third of the table at the end of the game. This was the first time I used my Geisha Spy, and she spent the entire game out for a nice walk, waving to all the opposing Ashigaru and enjoying the scenery amongst the fighting. I was playing Richard Carlisle, with his force of Monks and Ashigaru. The battle was a fairly tense affair – I was trying to keep his forces at arm’s length by keeping him under a hail of shuriken, and the game ended up revolving around a fight between our Heroes in the middle of the table, and Richard’s failure to kill a lone Ninja with a group of spearmen and Samurai (that Ninja led a charmed life for several turns). At the end of the game, we equally held the battlefield, but I won by virtue of causing more casualties. I was now facing Chris Vasey’s huge bandit force, and was feeling distinctly outnumbered (he had no less that eight commoner units, as well as two heroes). The aim of the game was to hold objectives, each of which was worth a number of victory points. The first issue of the battle was that one objective had to be placed in the centre of the table – which happened to be in the middle of a pool between two bridges. We decided to place the other four objectives at each end of either bridge, so the battle revolved around the centre of the table. Again, my tactic was to use my common Ninja to hold one of the river banks, and pepper the opposition with shuriken, thus forcing them to avoid incoming missile fire rather than moving across the bridges. This worked to certain extent, but Chris’ numbers started to tell, and then his two Samurai came across the other bridge. There began an epic struggle against my Ninja hero, which ended after three turns with my Hero still alive, though bleeding profusely from a gaping chest wound, but standing over the bodies of both opposing Samurai and occupying three objectives. At this point, I must admit to being somewhat in shock, having won three games. The fourth battle was against Ben Pengelley’s Samurai force – the aim of the battle was to simply claim more heads than your opponent. The game was another titanic struggle. My previous dice rolling of my thrown weapons appeared to desert me in this game, and my Ninja spent more like cutting themselves on the obviously razor-sharp weapons, instead of hurling them into the foe. The game quickly separated into three battles – one of Ben’s Samurai vs 2 common Ninja units, my Geisha against Ben’s Archers and Sergeant, and Our Heroes and Ben’s Spearmen duelling it out across the middle of the table. Ben held the advantage for much of the game, his Hero making short work of one of my Ninja groups. My Geisha calmly stalked his archers, but although managed to kill one on her initial charge, she quickly became a pin-cushion of arrows. The star of the battle was once again my Ninja Hero, who managed to kill two of Ben’s Samurai (including his Hero, though we spent several turns managing to attack and then roll critical successes on Avoid rolls) and two Spearmen – the second of which fell on the very last blow of the battle, thus ensuring that we drew – a very fitting result. What a fantastic day of battle. I had four thoroughly enjoyable games against great opponents. Warring States is all about having fun, with the actual scoring being secondary to having a good gaming experience – that aim was achieved with distinction. It’s been a while since I last played Test of Honour, and I am again reminded of what a fun game system it is, and I should really play it more often. Ninja are a fun force to play – the Common Ninja are a bit squishy if they don’t have an avoid roll (due to being unarmoured) but the fact that everyone has thrown weapons does cause problems for your opponent – they don’t cause a lot of damage (you need two or three blood drops on a target before they become really effective) but the fact that they cause avoid rolls cannot be underestimated – the general opinion from my opponents was that they were really annoying. The Hero is very effective, and in my experience he proved to be a very effective killing machine – dual-wield weapons are nasty when they critical. Let’s be honest here, the Geisha Spy is an incredibly gamey force choice. Yes, she is expensive, but in certain scenarios on the day she proved to be worth guaranteed points – the fact that she cannot be attacked unless she first charges an opponent makes her very frustrating in certain situations. When she does finally attack, with only 3 strength she proves to be remarkably toothless unless she has attached skill cards. There is one situation we faced on the day which I think needs to be addressed. In my game against Chris Vasey, my Geisha sat on an objective token for the entire game – no one could come within 1″ of her (as she couldn’t be charged) so she guaranteed some victory points, and there was nothing Chris could do about it. However, if the model is sat on an objective, she is obviously not an innocent bystander and is directly having an effect on the game – I think that in this circumstance, she should become a legitimate target and be able to be attacked by the opposition. 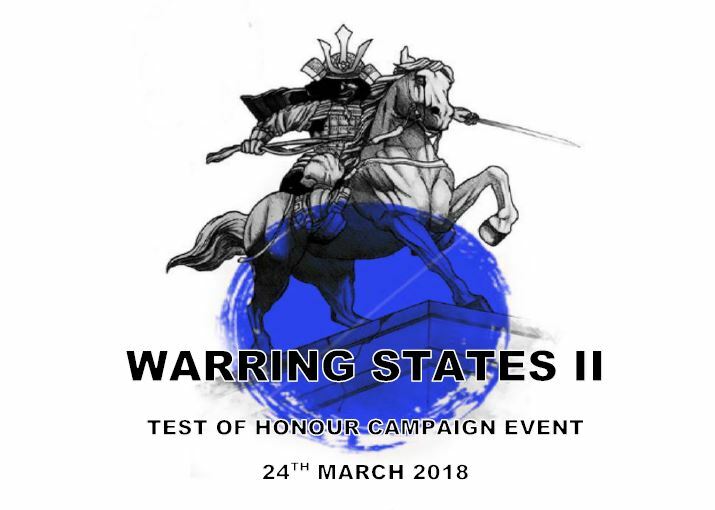 It was great event – thanks to Kieran Byrne and Jez Fairclough (plus helpers) for putting it all together – and I look forward to seeing everyone at Warring States III. A final note – a huge ‘Thank You’ has to go to David Mellor. At the first Warring States event, I admired his custom-built objective tokens (made from Japanese pennies). We played a great game with his undead warband fighting against my force which had a ‘Star Wars’ Imperial theme. As we stood together in the car park at the start of the day, David presented me with a set of objective markers that he had made, themed for my army – aren’t they fab? What a great gift – thanks again David! What a great day you all had..Some very fine terrain boards too. Yes, really liked the board – really liked how you had painted your buildings and the trees were lovely.